A few weeks ago I hosted a birthday party. It was perfect timing given the completion of the back patio. We sat outside and laughed until the sun went down. It was just the kind of celebration I was hoping for but the cake, the star of the show, was almost an epic fail. Let me explain. Here’s how the cake came together: Wisk together 2 cups of sifted cake flour, 1 teaspoon of salt and ½ cup of sugar. In a separate bowl combine 1 cup heavy cream, 2 tablespoons whole milk, 2 teaspoons baking powder and 4 large egg whites. Wisk in 1 ½ teaspoons vanilla, ½ teaspoon almond extract and another ½ cup of sugar. Then fold in flour mixture. I checked on the cakes throughout the 25 minute baking process. What the what! These cakes are not rising like I had expected. I can barely see them in the cake pans! I ran back to the recipe confident I hadn’t missed anything. But there it was in black and white. Use 8 inch pans. I had used 9 inch pans. Honestly, there was no time to panic. I got busy making a second white cake using the same ingredients with the same 9 inch pans so it wouldn’t look like I had skimped on the cake. While layers 3 and 4 were in the oven I started making the filling. I planned to use fresh raspberries for the filling but there was no way I’d be able to stretch it out over three layers. Fortunately I had blueberries and strawberries in the refrigerator, which was perfect for a last minute triple berry filling. Just a little side note the first frame shows only raspberries because that’s all I thought I was going to use when I took the picture. I added the other berries to the pot as referenced in the last 2 frames. If you’ve never made berry filling before it’s really easy. You need approximately 2 cups of fresh fruit, 1 tablespoon of cornstarch, 2 tablespoons of fresh lemon juice and ¼ cup of sugar. In a small saucepan, combine all of the ingredients and bring to a boil over medium to high heat. Keep stirring until thickened. 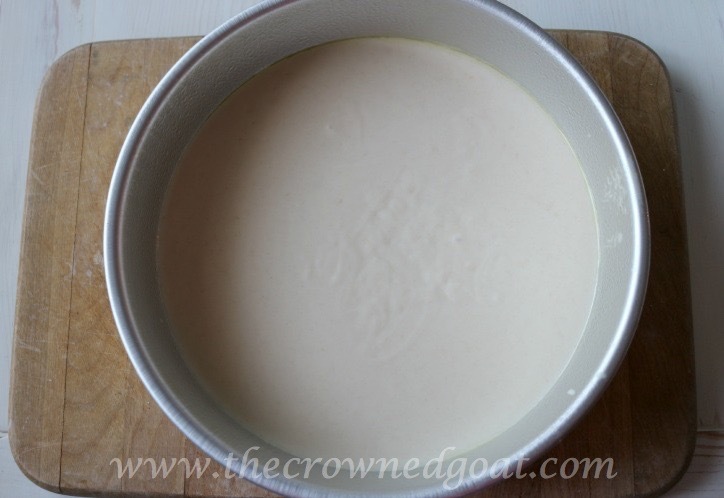 Allow mixture to cool completely before spreading over the cake. You can double or triple this recipe depending on how much filling you need. I always make a little extra. While I was waiting for the filling to thicken, I made the cream cheese frosting. I placed 8 ounces of cream cheese at room temperature, 8 tablespoons (1 stick) of butter also at room temperature, 1 cup of confectioners sugar and 1 ½ teaspoon of vanilla in my stand mixer and mixed it all together. On a side note, I would normally mix the cream cheese and the butter together first and then sift the powdered sugar in before mixing it all together with the vanilla. This helps eliminate lumps. But you guys, wow, time was running out. All of the cake layers must be cool to the touch prior to adding the filling. The filling also needs to be completely cooled. But once you start adding the filling to each layer, the magic happens. This is a dense cake, which really holds up to the filling. Depending on how much filling you put between each cake layer some of the filling might seep out and that’s ok. Once you have all of the layers in place, it’s time to start frosting the cake. Serve with a side of ice cream and drizzle any left over filling onto your fantastic creation. This cake is involved but it’s totally worth it. See you back here tomorrow. After taking a few pieces of furniture from the front porch to outfit the back patio, I’ve had to do a lot of rearranging! CoCo – this cake was a labor of love. I know that we have had our fair share of epic fails as well in the baking arena 🙂 You managed to keep your cool and make an even better cake! Thanks for the tip of how to make berry filling…we have never attempted that. Your cake looks delicious and you already know cream cheese frosting is our fave! We are sure your guests love this! Good morning, Coco! Your cake looks seriously heavenly; fluffy white frosting, and I love berries, any kind! This is the perfect dessert for Summer entertaining! Great save in baking more layers! Brilliant! Can’t wait to try and bake your recipe! Testament to how mistakes can turn into triumphs. I love the four layers. Makes the cake look more elegant. Hi! Visiting from Oh My Heartsie Girl. This looks delicious! I didn’t think using a different pan size would make a big difference! Anyway, your cake came out beautifully! 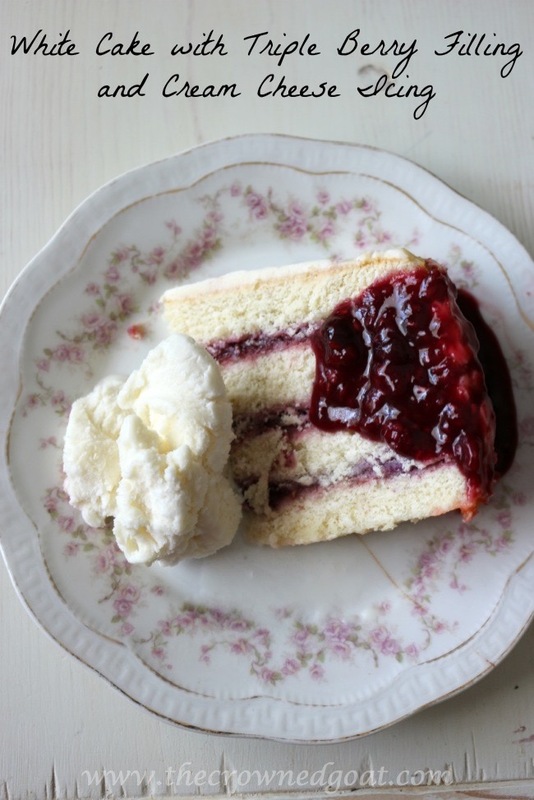 White cake with berry filling is my favorite cake and what I always request for my birthday! If anything could put it over the top it would be cream cheese frosting. This looks so good, CoCo! I clicked on the picture of your cake at our link party having no clue it was yours…it just looked so good I had to come check it out :). Pinning for later! Coco – love this! Perfect for the holiday weekend! Sharing tonight on the Link Party! Thanks for sharing! Suzanne recently posted…Before and After! Honestly, this is too gorgeous to eat! Thanks for linking up and sharing with us at Funtastic Friday. Hope you join us again this week. Recipe pinned!